Photo by Sam Thiel Marshall’s Hailey Brandt competes in the 200-yard individual medley during their meet against Montevideo on Thursday. The Tigers defeated the Thunderhawks 99-78. 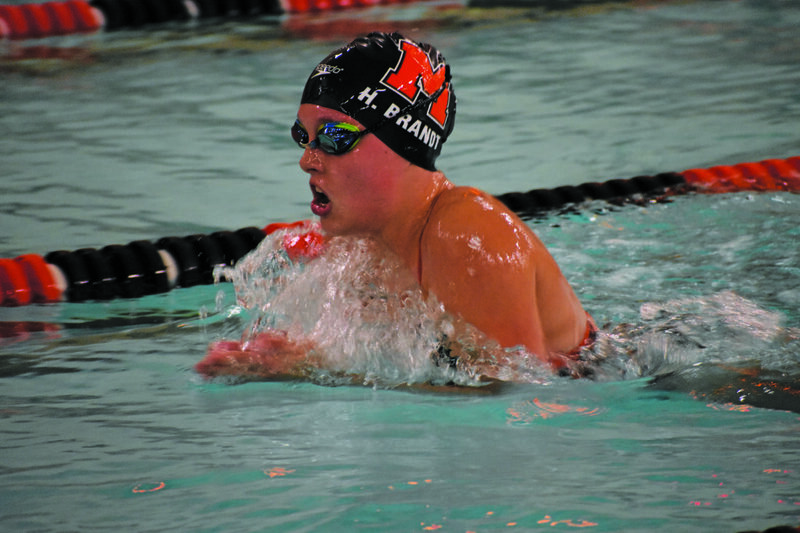 MARSHALL – The Marshall swimming and diving team wanted to make an early-season statement in its own pool on Thursday. Using depth and strong times, the Tigers did just that, as Marshall defeated Montevideo 99-78 in its home opener at the Don Palm Natatorium. Marshall coach Nikki Bell said she was happy to see her team showcase their talents at home and post strong times early in the season. Nyssa Bentz took first place in the 100 butterfly at 1:02.46 and won the 200 freestyle with a time of 2:01.69. Hailey Brandt took first place in the 200 individual medley (2:23.88), followed by Paige Milstead (2:45.15) and Tera Johnson (2:47.65) in third and fourth, respectively. Brandt also won the 100 freestyle with a time of 56.64 seconds. Reagan Brandt was Marshall’s top diver with a score of 135.20 Brooklyn Gossen finished second with a score of 134.10, while Elsa Black scored 130.35. Hurst (5:43.30) and Brandt (6:26.60) finished first and second in the 500 freestyle, followed by Paige Milstead in third place at 6:31.12. Hailey Brandt, Nyssa Bentz, Kaylie Stucke and Lydia Hurst won the 200-yard medley relay with a time of 2:01.70. KC Boerboom, Emma Beavers, Maddie Larson and Paige Milstead finished in third with a time of 2:09.41. Maddie Larson, Mansi Bell, Paige Milstead and Alli Kopitski won the 200 freestyle relay at 1:56.09. Lydia Hurst led Marshall with a second-place time of 26.61 seconds in the 50 freestyle. Kaylie Stucke (27.67 seconds) and Maddie Larson (29.19 seconds) finished third and fourth, respectively. Bell said their key during the meet was their ability to spread their athletes around to multiple events and get some depth in their lineup. Marshall will compete this weekend on Saturday at the University of Minnesota at noon against Minneapolis Southwest. Bell said they’re looking forward to swimming in a larger facility, especially the one that hosts the state meet.